Cognitive biases can influence academic peer review, more so when done in groups. Even if this is rare, prudence dictates we anticipate it and combat it. FOREMAN. . . . Nine . . . ten . . . eleven . . . That’s eleven for guilty. Okay. Not guilty? (EIGHT’s hand is raised.) One. Right. Okay. Eleven to one, guilty. Now we know where we are. THREE. Somebody’s in left field. (To EIGHT) You think he’s not guilty? EIGHT (quietly). I don’t know. THREE. I never saw a guiltier man in my life. You sat right in court and heard the same thing I did. The man’s a dangerous killer. You could see it. EIGHT. He’s nineteen years old. THREE. That’s old enough. He knifed his own father. Four inches into the chest. An innocent nineteen-year-old kid. They proved it a dozen different ways. Do you want me to list them? TEN (to EIGHT). Well, do you believe his story? EIGHT. I don’t know whether I believe it or not. Maybe I don’t. SEVEN. So what’d you vote not guilty for? EIGHT. There were eleven votes for guilty. It’s not so easy for me to raise my hand and send a boy off to die without talking about it first. SEVEN. Who says it’s easy for me? SEVEN. What, just because I voted fast? I think the guy’s guilty. You couldn’t change my mind if you talked for a hundred years. EIGHT. I don’t want to change your mind. I just want to talk for a while. Generally speaking, we can observe that the scientists in any particular institutional and political setting move as a flock, reserving their controversies and particular originalities for matters that do not call into question the fundamental system of biases they share. When legal juries convene, judges and attorneys are (or, at least should be) highly aware of the cognitive biases that affect rational decision-making. Competent attorneys seek to exacerbate or mitigate these biases to benefit their clients, sometimes aided by jury consultants, and competent judges strive for due process. These are highly skilled professionals who have developed considerable knowledge [just search online for ‘jury decision making psychology’, ‘litigation psychology’, ‘legal psychology’, and so on]. When academic juries convene – as in review of funding applications or promotion cases – the deliberation is often uninformed by any consideration of possible cognitive bias. To the contrary, the jurors assume that – because they are academic faculty, having been selected for their training, accomplishment, and critical ability – they are capable of completely rational decision-making and immune to cognitive biases. To accuse an academic peer reviewer of bias is a serious charge indeed. As for knowledge about the impact of cognitive biases in peer review, aside from implicit bias with respect to the typical axes of diversity, scholarly works are few and far between. van Arensbergen et al. is the best recent review. What do we know about group decision-making, such as in legal juries, that might also interfere with academic peer review, and what might be done about it? In both cases, the ideal is consistently to apply a standard (the law, academic contribution and promise) to data in the same way that trained graders of gemstones or judges of animal breeds can in isolation arrive at identical assessments. In both cases we stray far from the ideal because (a) we are judging people, and (b) the jurors are people, and the judging is not private. Framing. The way in which information is presented influences assessment. For example, “70% of her papers appeared in high-impact journals” and “30% of her papers did not appear in high-impact journals” are quantitatively identical, but the latter is interpreted more negatively than the former. Anchoring (‘if it costs that much, it must be good’). A form of framing in which the first information given influences the interpretation of subsequent information. In real estate or automobile sales, if the asking price or list price is given first, subsequent negotiations will proceed from this price rather than a true estimate of value. If peer reviewers first learn that a candidate is highly/poorly cited, a full professor vs. a lower rank, from a prestigious vs. second-tier institution, the assessment can differ accordingly. Hindsight bias (‘anybody could have seen it coming’): For both promotion and funding applications, reviewers may alter their assessment according to whether flaws were/are foreseeable (and can be anticipated if not avoided or prevented), or not. We are biased to overestimate foresight and blame others for not foreseeing what, in hindsight, appears obvious (cf. ‘Monday morning quarterbacking). Confirmation bias (‘my mind is made up; don’t confuse me with the facts’): We overemphasize data that confirm preliminary conclusions, and tend to ignore data that contradict them. Recency bias or Primacy effect (‘but that was then’): in assessment, we tend to overweight recent accomplishments and information, and underweight prior accomplishments and information, all else equal. Presentation bias (looks good, therefore is good; looks bad, therefore is bad): As Chia-Jung Tsay begins in her PNAS paper: “We do judge books by their covers. We prefer the nicely wrapped holiday gifts, fall in love at first sight, and vote for the politician who looks most competent.” The way in which academic accomplishments are presented can influence our assessment of our merit. 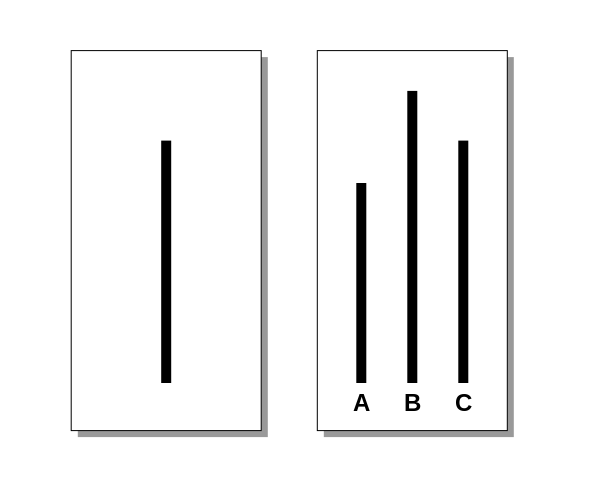 and asked: “Which line on the right is the same as the one on the left?” All give the correct answer. The judgment is repeated several times with different sets of lines until it is routine. Then, by prearrangement, the seven already in the room start giving a conspicuously wrong answer. At first, the man disagrees. Eventually, however, the man joins the majority in giving the wrong answer. This is the famous Asch experiment. 75% of subjects agree to at least one wrong answer. Anchoring is described above. In any group, typically the first statement made anchors the discussion. That is, if the first speaker supports or opposes promotion/funding, the ensuing discussion ensues in relation to this first statement. If on the old NIH rating scale the first reviewer proposes a score of 2.0, others might disagree by proposing scores of 1.7 to 2.3. If the first reviewer had instead proposed 3.0, others might disagree with scores of 2.7 to 3.3. Many promotion reviews occur in multiple steps (e.g., department, promotions committee, dean, and provost); the early steps tend to anchor the later steps. Social Influence/Groupthink/The Bandwagon Effect/The Abilene Paradox: The desire for concurrence, consensus, and cohesion in a group can temper or even overwhelm independent assessment. That is, participants in peer review will alter their independent assessments so as to conform to a majority opinion. This undermines ‘the wisdom of crowds’. As in the Asch experiment, those holding a minority judgment can be tempted to mute or abandon it because they are in minority rather than because the judgment is incorrect. Those in the majority can be overly resistant to challenges to their conclusion and prone to confirmation bias. Social anxiety; fear of displaying stupidity, low standards, limited expertise, poor judgment, lack of confidence. Such displays undermine status in academia, and with it access to resources and resistance to threats. When their judgments can become known, assessors may express no judgment or pretend to agree with the majority or seemingly assertive, authoritative assessors to avoid ‘looking bad’ in the eyes of their peers. Admittedly these impacts are largely extrapolated to academic assessment from work in other contexts and, as noted, studies of academic peer review are few. These works suggest that extrapolation is not unwarranted, however. What can be done to minimize the influence of these cognitive biases and tendencies? √ Education. As has been stated, in academia reputation and stature are linked to the demonstration of sound judgment and wisdom free of bias, and simply knowing that fellow judges are on the lookout for bias ought to deter it. A precondition is that the fellow judges must know what biases to look for, and individuals must know what biases to avoid displaying. √ Avoid framing and anchoring. In an ideal world, all framing (identities and affiliations of the candidate, authorship position and co-authors, titles of publications outlets, honorifics, etc.) would be redacted from review materials so that reviewers would be forced to focus on the unadorned work itself. This is likely impossible [although at my institution one ambitious department did its initial screen of applicants for a position by considering only the abstracts of exemplary publications – with bibliographic and other identifying information redacted]. But some framing/anchoring can be withheld. For example, in promotion discussions at my institution we used to begin with the de-identified preliminary scoring of the members; we no longer do. √ Empower all reviewers. Many disasters are due to groups not working together and members’ reticence to express concerning observations to their superiors. To combat this in aviation, crews practice cockpit resource management or CRM. CRM aims to foster a climate or culture where the freedom to respectfully question authority is encouraged. It recognizes that a discrepancy between what is happening and what should be happening is often the first indicator that an error is occurring. This is a delicate subject for many organizations, especially ones with traditional hierarchies, so appropriate communication techniques must be taught to supervisors and their subordinates, so that supervisors understand that the questioning of authority need not be threatening, and subordinates understand the correct way to question orders. These are often difficult skills to master, as they may require significant changes in personal habits, interpersonal dynamics, and organizational culture. Opening or attention getter – Address the individual. “Hey Chair,” or “Professor Smith,” or “Jane,” or however the name or title that will get the person’s attention. √ Voting: Always vote by private if not secret ballot or its equivalent. The rationale is obvious. Cognitive bias in peer assessment hopefully is rare and of little influence. Prudence dictates that we expect it, combat it, and are pleasantly surprised when it doesn’t occur. The only always ineffective strategy is to pretend it doesn’t exist. Gunnar Myrdal, Objectivity in Social Research, as cited in Klein, DB and Stern, C. 2009. Groupthink in academia: majoritarian departmental politics and the professional period. Independent Review 13: 585-600. “Might”≠”will”. In my experience, the vast majority of peer assessment leads to sound judgment. This does not excuse us from increasing the size of this majority and reducing the incidence of misjudgments rooted in cognitive biases, etc., however. Informing ourselves about these biases is a necessary first step. My institution is committed to reducing if not eliminating the influence of cognitive bias on promotion decisions. https://cs.uwaterloo.ca/~shallit/Papers/stages.pdf is an exhaustive and masterful review of the concept. Confirmation bias is the third stage. Although there must be a pre-existing name for this bias in the literature, I do not know it. Perceptive readers will recognize this statement as an example of framing and anchoring. Humans are not that susceptible to normative social influence, but are susceptible nonetheless. Klein and Stern (see endnote 3) treat very generally how groupthink may devalue dissenting views, even if well-founded, in academic units. Langfeldt shows that peer review groups may autonomously establish priorities or practices that influence outcomes, or as she puts it “The guidelines given to the panels had little effect on the criteria they emphasized… Put more clearly, panels do as they like…” Recently Park et al. have modeled how peer pressure in review – herding – may stifle innovation (or penalize innovators). Langfeldt, L. (2001). The decision-making constraints and processes of grant peer review, and their effects on the review outcome. Social Studies of Science, 31(6): 820-841. Park IU, Peacey MW, Munafò MR. 2014. Modelling the effects of subjective and objective decision making in scientific peer review. Nature 506:93-6. doi: 10.1038/nature12786. Fortunately, the legal process in US jury trials includes the use of a tool designed to protect one’s constitutional right to an impartial jury. Known as voir dire (see http://legal-dictionary.thefreedictionary.com/voir+dire), the tool is used to determine if any juror is biased and/or cannot deal with the issues fairly, or if there is cause not to allow a juror to serve (knowledge of the facts; acquaintanceship with parties, witnesses or attorneys; occupation which might lead to bias; prejudice against the death penalty; or previous experiences that might influence the juror’s impartiality). As senior academicians, we may need to be more diligent in “calling out” our peers’ potential biases as there are no attorneys engaging voir dire in the selection of peer review committees. I’ve often wondered about the effects of deeply held biases by review committee members. Just how impartial can they be?